Last major update issued on September 14, 2006 at 01:50 UTC. The geomagnetic field was quiet to unsettled on September 13. Solar wind speed ranged between 348 and 380 km/s (all day average 372 km/s - increasing 26 km/s over the previous day). Solar flux measured at 20h UTC on 2.8 GHz was 82.9. The planetary A index was 6 (STAR Ap - based on the mean of three hour interval ap indices: 5.5). Three hour interval K indices: 13221101 (planetary), 13321100 (Boulder). 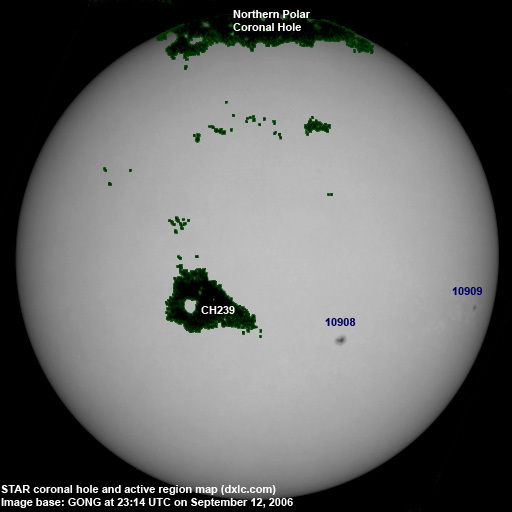 Region 10909 was quiet and will be rotating over the southwest limb today. September 11-13: No obvious partly or fully Earth directed CMEs were detected in incomplete LASCO imagery. 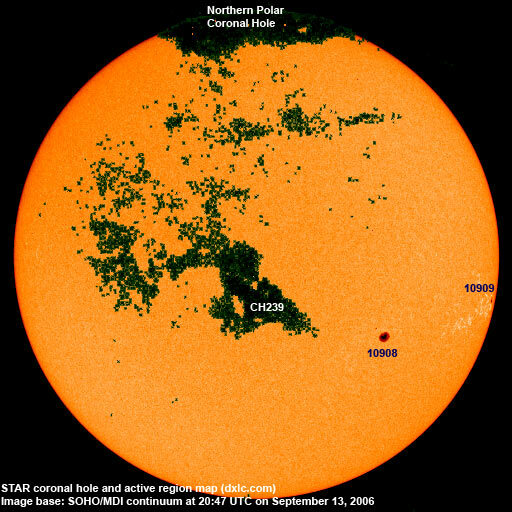 A recurrent trans equatorial coronal hole (CH239) will rotate into an Earth facing position on September 13-15. The geomagnetic field is expected to be mostly quiet on September 14-15. 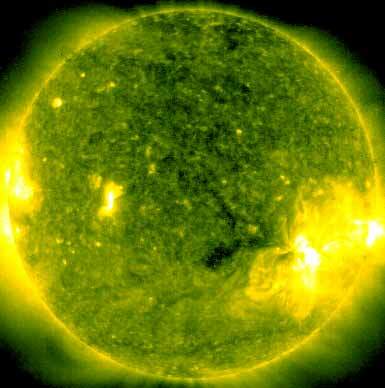 Coronal hole effects are likely on September 16-19. Long distance low and medium frequency (below 2 MHz) propagation along east-west paths over high and upper middle latitudes is good. Strong signals from the east coast of North America were heard on a number of frequencies. The usual Newfoundland stations were good at 22:30 UTC and the northeastern US stations well heard as early as 23:30 UTC. Propagation on long distance northeast-southwest paths is very poor.